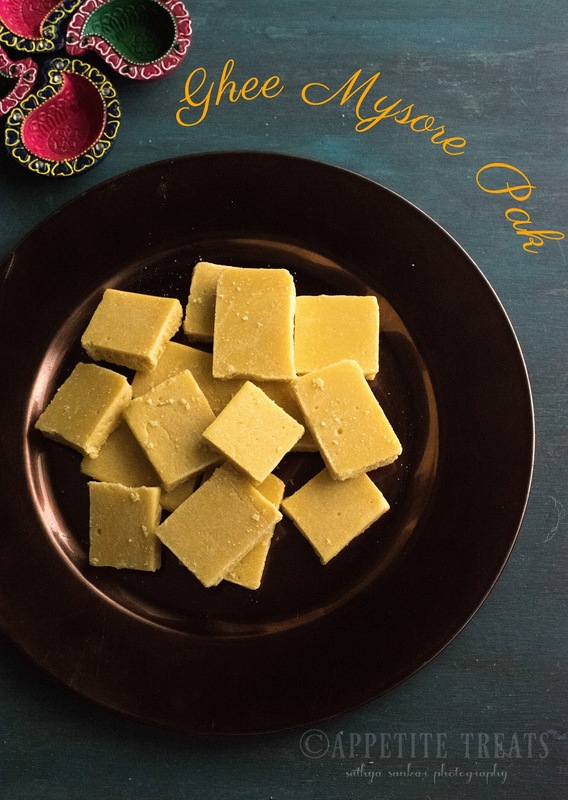 Ghee mysore pak is an easy and delicious sweet that could be made in no time. 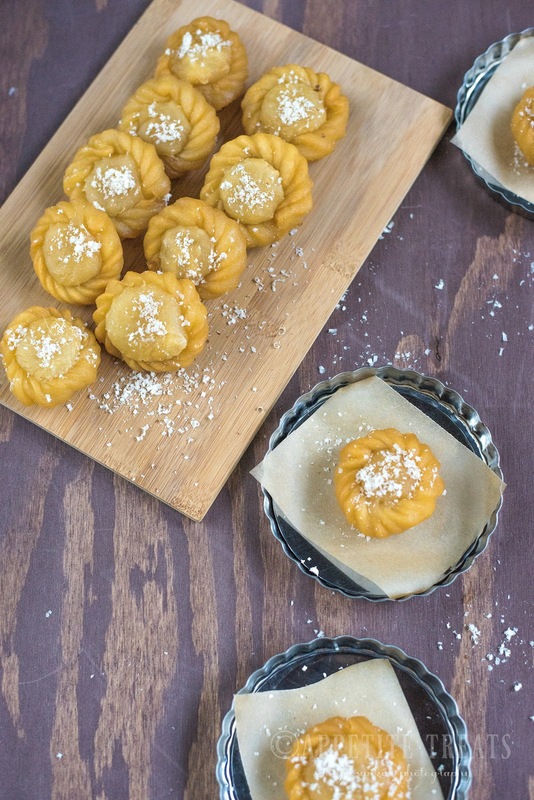 As the name suggests it is made with ghee, lots of ghee to be very specific, which gives this sweet a soft and creamy texture which literally melts-in your mouth. 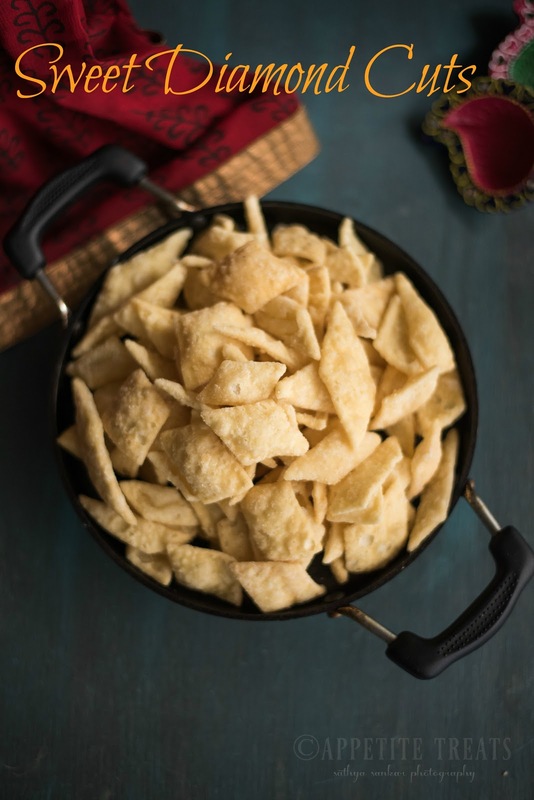 When i was little, during diwlai days we used to get the mysore paks which are hard ones with a crunchy texture and i have always disliked them. There was a certain period when krishna sweets become talk of the town and everyone raved about their sweets and savories, especially the mysore pak. When i tasted their mysore pak for the first time, the soft texture with ghee oozing out made me fell in love with it instantly. 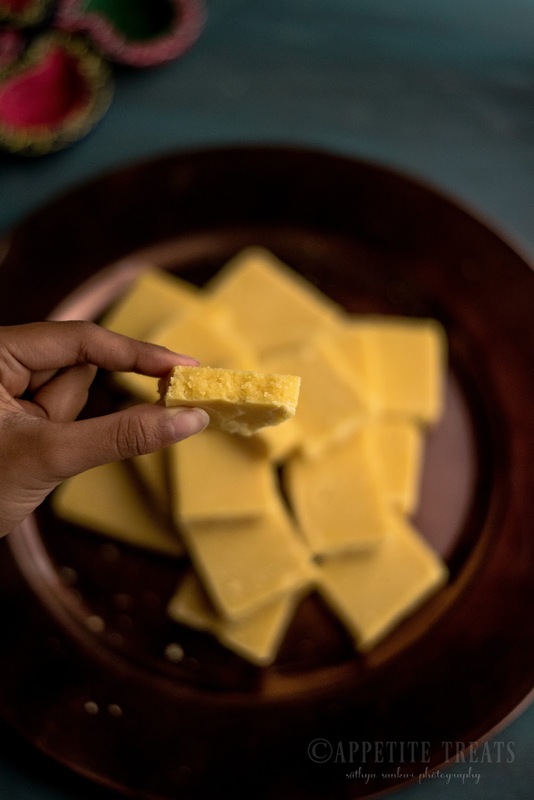 Recently i came to know that making a mysore pak closer to the one we get in krishna sweets was very easy and the secret ingredient was the ghee. I have made this several times now, and it always turns out perfect everytime. 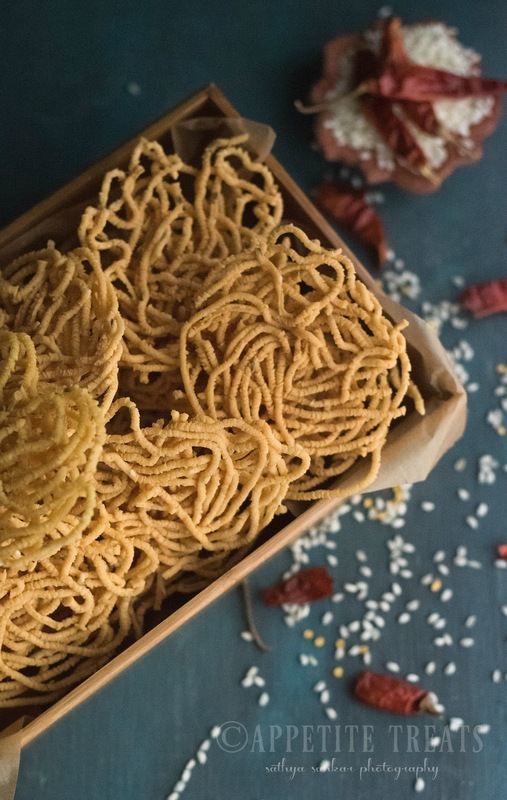 Try this easy and delicious sweet for diwali and surprise your loved ones! 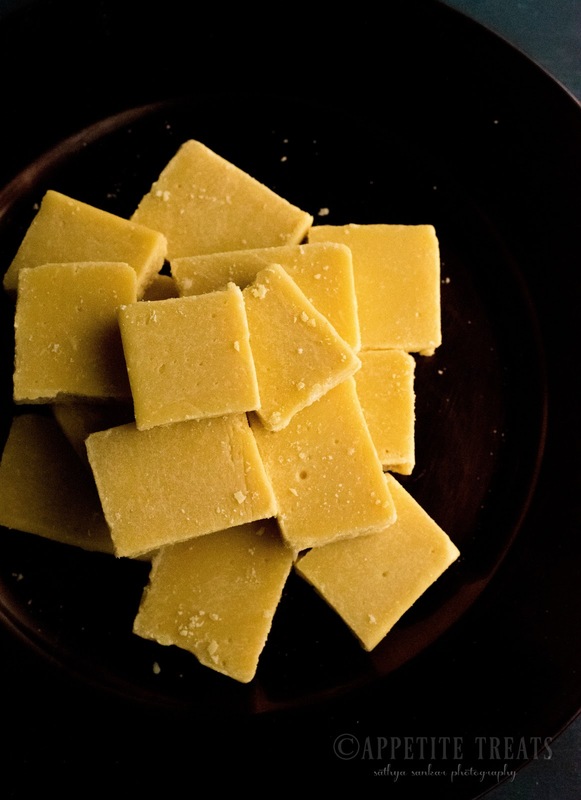 Grease a square baking pan or a desired pan that you will be using to set the mysore pak and set aside. In a heavy bottomed pan, roast the besan / chickpea flour until the raw smell disappears. Transfer the besan to a bowl and add 1 cup of ghee, Using a whisk stir to combine without any lumps. In another pot, add sugar and 1/4 cup water and bring to a boil, check for the sugar syrup to reach one string consistency. Now slowly add the began-ghee mixture into the sugar syrup and stir gently to combine. Keep stirring until the mixture well incorporated and the you see tiny bubbles inn the sides of the pan. At this stage gradually add the remaining 1/2 cup ghee and keep stirring until all the ghee is absorbed. At this stage you will see the mixture leaving the sides of the pan, switch off the flame and transfer the mixture to the greased pan. Smooth the top with a spoon and let it set. When its still warm and not completely set, using the knife to cut tinto desired shape. Let it cool completely. 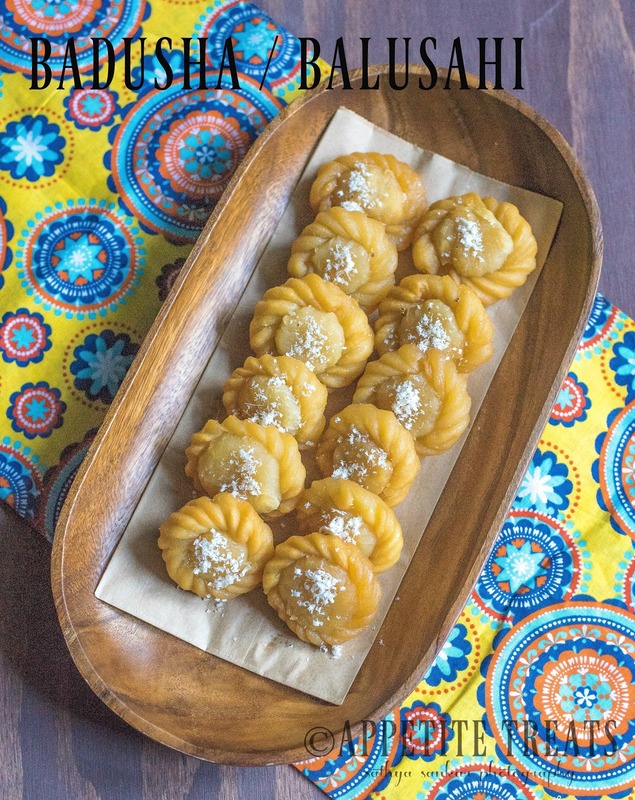 Badusha as called in south or Balusahi in north, is one of the classic indian sweet that is made during diwali and special occasions. 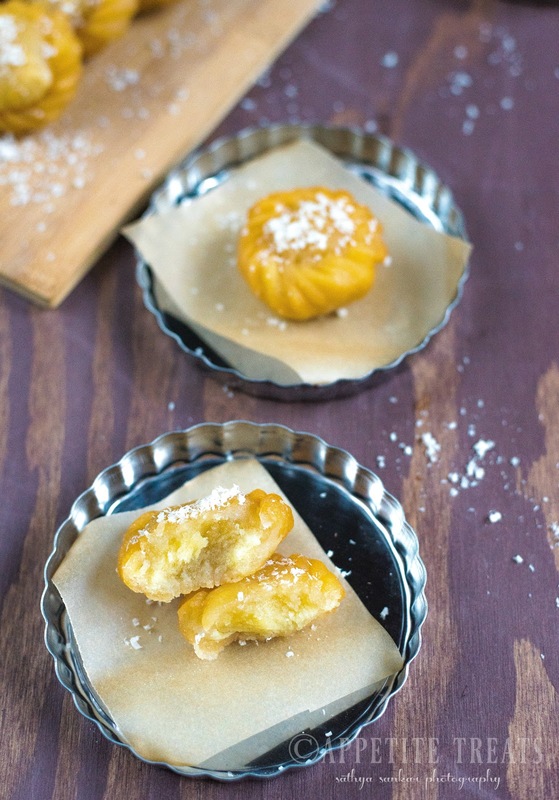 It is quite similar to glazed doughnuts in look but varies in its texture and taste. At first i was very skeptical to try it thinking it wouldn't turn quite right, but somehow convinced myself and made it one fine day . It turned out amazingly perfect with crisp on the outside and flaky on the inside 😌. 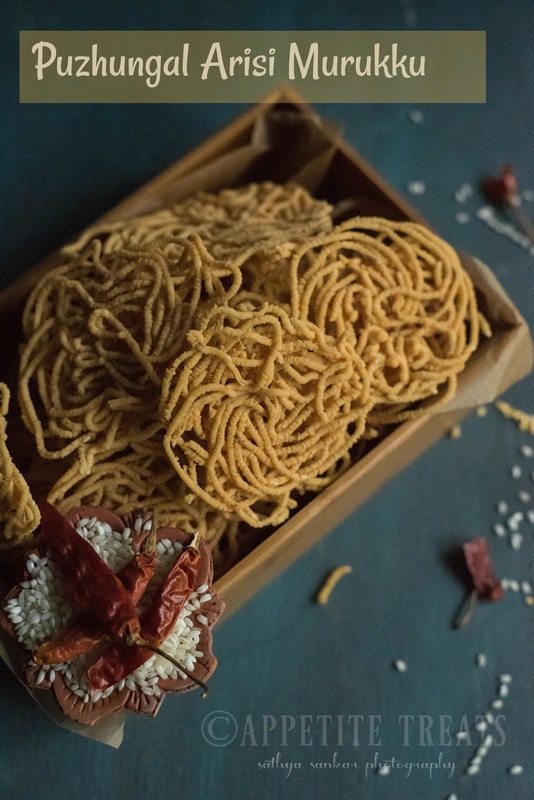 There are so many recipes for badusha out there, some uses curd, some with a mixture of oil & ghee and some with just butter etc, follow which one works best for you. 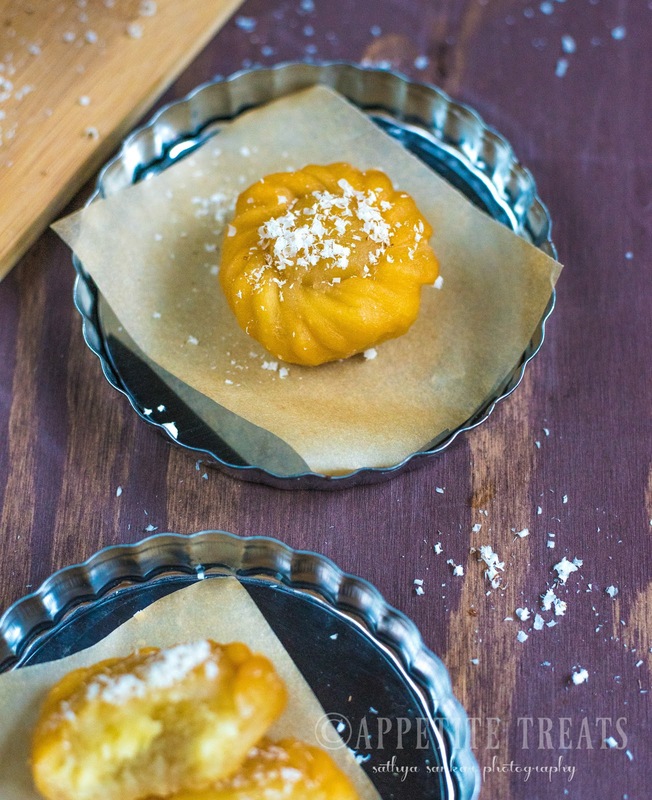 Once you have mastered the technique of making badusha it will be a breeze to make them. Sieve flour, baking powder, baking soda into a wide bowl. Add the sugar and mix well. Add in the butter and mix until all the butter is incorporated, rub the mixture with the palm of your hands until resembles a sand texture. Now slowly add the milk little by little and mix to form a dough. Do not knead harder, the dough should be soft but not smooth. Keep it covered when preparing the sugar syrup. In a heavy bottomed pot, add the sugar and water. Once the sugar dissolves and the syrup starts boiling, check for consistency. The syrup should reach one thread consistency, check by pulling your forefinger and thumb and it should form a single thread . Switch of the flame, add the lemon juice and cardamom, set aside. 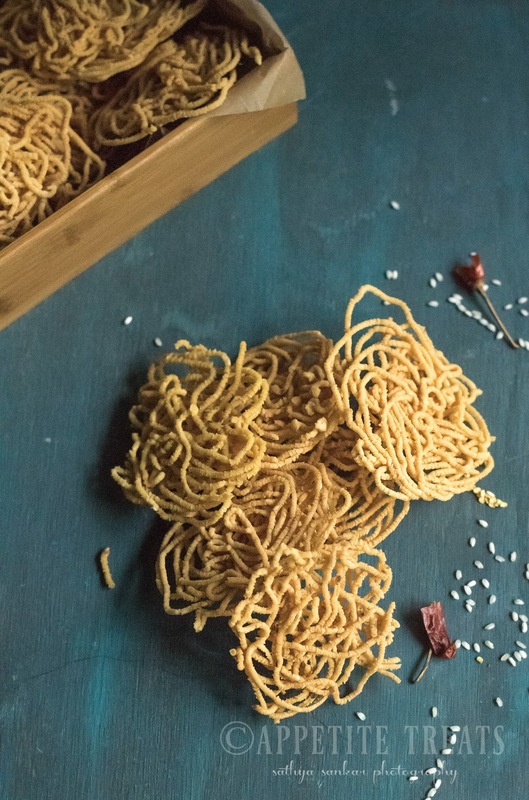 Make small balls from the dough and shape it like small doughnuts or pinch the sides and fold as you would for Kozhukattai and keep it covered until you start frying. 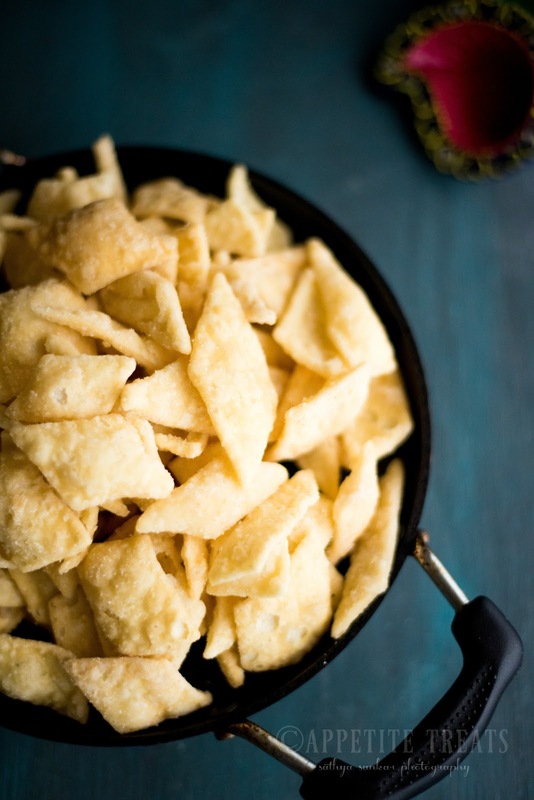 Drop the shaped dough in to the oil, once the badusha starts floating, lower the heat to medium and keep frying until it cooked through and turns light golden. Drain from the oil and immediately soak them in the sugar syrup. Repeat the same with the remaining dough. Let the badusha soak in the syrup for 20 minutes, turning them in between. Remove from the syrup and enjoy! A perfect mini heart-shaped treat with a delicious jam filling! This is an easy dessert that you can plan for making this valentine's day. I have never made pie in my life and when i decided to make these heart treats i was looking going through couple of recipes in pinterest which used store-brought per crusts and some of them were made with shortening. So i just skipped the shortening part and used just butter and flour. Making the dough is very easy, just add all together and mix it to form a dough. This crust would work for large pies too. Once baked it was very flaky and the jam filling gave it a nice sweetness making it a perfect dessert. I used blackberry jam as the filling, sky is the limit, you can use any type of filling you like. In the bowl of food processor, add together flour, salt and butter. Pulse together for a crumbly mixture. Add the ice cold water little by little and mix the flour and butter mixture until it comes through to form a dough. Move the dough on to a floured surface and roll the dough in to a circle. Using a heart cutter, gently cut the dough hearts and place them in the lined baking sheet. Roll again and repeat with the remaining dough. You must be having even number of hearts. Brush extacly half the number of hearts with egg wash and place a small amount of jam on top. Close the filled hearts with the remaining hearts and press gently, make sure you seal the hearts on the edges well, other wise the filling may come out. Using a small round tip, press gently on the edges of the hearts to make it pretty. Sprinkle the sugar on top and bake for 15 minutes or until the hearts golden brown on top. Let it rest on a wire rack until cool. The measurement mentioned above makes about 10-13 treats. You can double the recipe. Using cold butter and ice cold water is very important for making the crust very flaky. Instead of using jam, fresh fruits, chocolates, pie filling also can be used. Make sure to seal the edges well, few of my treats opened up while baking and filling separated, you dont want this! Instead of brown sugar, white sugar or even colorful sugar sprinkles can be used. This Chocolate cake with oreo cream filling and whipped cream frosting is one decadent rich dessert! I made this for my daughter's 10th birthday, she is the biggest oreo lover i have ever known! The layers of chocolate cake with the rich flavors of oreo mixed in with the smooth and velevttty whipped cream is a combination to die for. I normally like swiss meringue buttercream for my cakes but this time wanted to go easy with the butter (you need loads of butter for swiss meringue) so i went with making whipped cream frosting. To stabilize the whipped cream i added the instant pudding mix (jell-o, refer to the notes below). i decorated the cake with ombre effect and piped some hydrangeas on the top of the cake. This cake will be a great treat for Valentine's day, just change the color of the frosting to red and you can wow your guests! Preheat the oven to 350°F and line and grease an 8.5-inch round cake pan with parchment paper. In a medium bowl, combine the chocolate and cocoa powder. Pour the boiling water over and whisk until smooth. Set aside. In another bowl, sift together the flours, salt and baking powder and set aside. In the bowl of a stand mixer, fitted with paddle attachment beat the butter on medium-high until light and fluffy. Add in the eggs one at a time, beating well after each addition and make sure to scrape down the bottom and sides of the bowl to ensure even mixing. Add the sour cream and vanilla and beat on medium until just combined. Reduce the speed to low, add the flour and chocolate mixture alternating between the two. Starting and ending with the flour mixture. Beat just until combined. Transfer the batter to the greased pan and bake for about 25 to 30 minutes or until a tooth pick inserted comes out clean. Let the cake cool in the pan for 10 minutes and then invert it onto a wire rack to cool completely before frosting. Making the Frosting: Make the frosting in two batches. Place the oreo cookies in a food processor and process into crumbs. In the bowl of a stand mixer fitted with the whisk attachment, add in the heavy cream, pudding mix, vanilla and sugar. Mix on a low speed until combined. Increase the speed to medium high and whisk until the cream starts to form stiff peaks. When you lift the whisk the cream should hold a peak without falling off. Fold in the hero crumbs into the cream gently with a spatula. Cover with a plastic wrap and refrigerate until you make the second batch of the cream. Repeat the steps 2-4 to make second batch of the cream. Divide the cream into small bowls and mix in the gel food colors. Divide the cake into three layers using a serrated cake knife. Place one layer on the cake stand and spread about 1/2 cup of the oreo cream with a palette knife. Place the second layer on top of the first layer and spread about 1/2 cup of the oreo cream. Place the third layer on top and crumb coat the whole cake with the remaining oreo cream. Let the cake sit for about one hour in the fridge before decorating. Once the cake is chilled, frost the whole cake with the remaining cream and decorate as desired. The instant pudding mix already has sugar in it, so when adding powdered sugar to the whipping cream, start with one tablespoon and taste as you whip the cream half way. If you need more sweet add at this point and whip. Leave the cream covered in the fridge, when not working with it, otherwise it may become too soft. The amount given for the cream can make about 6 cups of frosting. If you are not decorating the whole cake, then reduce the amount accordingly. Leftover frosting can be freezed upto one month in a airtight container. Bring it to room temperature and rewhip before using. I used a wilton tip 2D to pipe the hydrangeas on the top of cake. The cake can stand stand at room temperature for about one hour after decorating. If not consuming the cake immediately, cover it with a cake dome and refrigerate. Bring it to room temperature before serving. Chocolate Fruit cake truffles are wonderful treats to serve in a party. Made with left over fruit cake from christmas, these decadent truffles are an ideal treat to serve your guests. 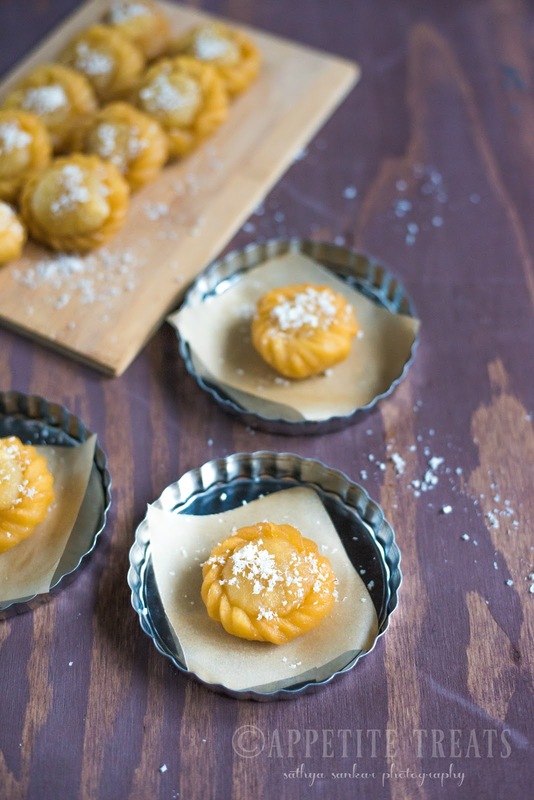 Its not too late, make these for your new years eve party and impress your guests. Heat the cream and pour over the chocolate. Mix well until the chocolate is melted and smooth. Add in the fruit cake crumbs and mix well until incorporated.Refrigerate the mixture. Roll the mixture into balls about a tablespoon full. Toss it in the cocoa powder, desiccated coconut, sprinkles or crushed almond. Refrigerate for 30 minutes until firm. Using the food processor or your hands crumble the fruit cake into fine crumbs. Place the chocolate morsels into a mixing bowl. In a microwave safe bowl, heat the cream for 40 seconds on medium-high. Pour the heated cream over the chocolate and stir well until all the chocolate is melted and mixed well. Add in the crumbled fruit cake and mix well without any big lumps. Cover the mixture with a plastic wrap and refrigerate for 30 minutes or until the chocolate is set. Remove the chocolate mixture from the fridge. Using a Tablespoon measure, roll the mixture into balls and place on the lined baking tray. Repeat with the remaining mixture. Now toss each balls in sprinkles, desiccated coconut, cocoa powder or crushed almonds. Refrigerate the truffles for 30 minutes or until firm and enjoy! Instead of using dark chocolate, you can use all semi sweet chocolate. You can also coat the balls in melted chocolate to make a hard shell. If the balls stick to your hands while rolling, just dip your hands in water and then roll.